Charles Hugh Smith* considers the battle as boiling down to between what controls the markets - central banks or fundamentals? .. "Bulls are confident that central banks have their back in 2016. After all, whatever it takes has successfully pushed equities higher for seven years. Why not an eighth? Many Bulls also believe the global downturn is over and higher growth is just ahead. Bears see equities in a multi-year topping process .. Bears see sagging profits and stagnant sales as evidence that fundamentals no longer support historically high valuations." 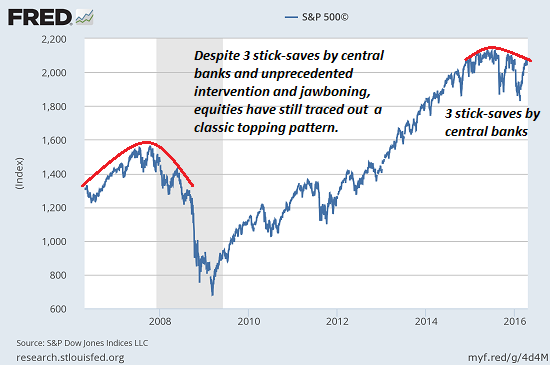 .. conclusion: "The battle boils down to what controls the market: central banks or fundamentals. Belly up to the roulette wheel and place your bets, but don't forget that rigged games can suddenly become unrigged at the most inconvenient moments."